" Are Republican Voters Finally 'Warming Up' to Climate Change Science? 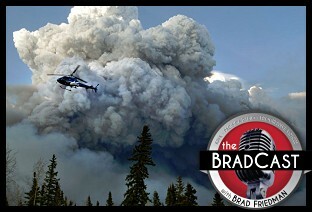 : 'BradCast' 5/5/2016	"
That news comes not a moment too soon, as record high temps in Alberta, Canada's tar sands oil region (ironically enough) sets the town of Fort McMurray on fire and sends some 80,000 residents scrambling for their lives amidst "apocalyptic" devastation. But are the attitudes of GOP voters on the planet's climate crisis changing quickly enough to prevent the worst effects of global warming, even as the Republican Party's apparent standard-bearer this year, Donald Trump, regards the science as little more than a massive "hoax"? "I think there's a lot less division on this issue than gets made out in the media," Sutter tells me on today's show. "The skeptical voices, especially on the conservative side, are often heard the loudest. They come through the loudest on blogs. They have big media platforms and they get attention. But I don't think that's representative of what the actual American public thinks, and what the voters think. I do think there's a lot more room for agreement on climate change between conservatives and liberals than is often made out in the media." In fact, as Sutter notes in his column on the new survey from the Yale and George Mason University's programs on on Climate Change Communication, "The percentage of conservative Republicans (not just Republicans but conservative Republicans) who believes climate change is happening has jumped 19 percentage points in the last two years, to 47%." He goes on to explain why that movement seems to be occurring now and to offer his explanation for the apparent contradiction between a huge majority of GOPers who support research into clean, renewable energy, even as so many of them remain climate crisis deniers. "I think there's a disconnect between what people believe out there in reality and what politicians are willing to say. Because for them to propose regulating carbon dioxide as a pollutant, for example, they'd have to go up against some pretty monied special interests," he says. "There's a difference between real people and what politicians are willing to take up." We also discuss Sutter's very encouraging recent reporting on the upcoming Washington state Initiative-732, which would put a price on carbon emissions --- "this often gets called the 'Holy Grail' of climate change policies," he says --- so that polluters will no longer be allowed to pollute for free. Just over the border in British Columbia, where a carbon tax was implemented in 2008, he explains, "the sky didn't fall" as predicted by fossil fuel industry opponents. In fact, "their economy has actually been out-pacing the rest of Canada" and "the level of support for the carbon tax has grown over time." While Sutter's reporting on these issues at the CNN website is fantastic, I felt I still needed to ask him about the dearth of climate reporting on CNN's airwaves where, as a study last month found, viewers "see far more fossil fuel advertising than climate change reporting." Also on today's BradCast: The U.S. Dept. of Justice notifies of North Carolina that their new law to discriminate against the LGBT community is a violation of the federal Civil Rights Act and may cost the state more than $2 billion in federal education funding; and Donald Trump, who will desperately need Hispanic voters if he hopes to win the Presidency this November, offers a remarkably offensive tweet on Cinco De Mayo. Because, of course he does. « PREVIOUS STORY "'Green News Report' - May 5, 2016"